One of the things I’d like to do more (or at all, if I’m being honest) in 2015 is send more letters. There’s something wonderful about checking the mailbox and seeing an envelope from a friend. The problem for me is that my handwriting is just terrible. Once I learned to express myself clearly in written form, I stopped caring about niceties. So, my penmanship hasn’t improved much since the 1st grade. I want to send thoughtful snail mail to my beloveds, but I also want it to be legible and not look like an office memo. 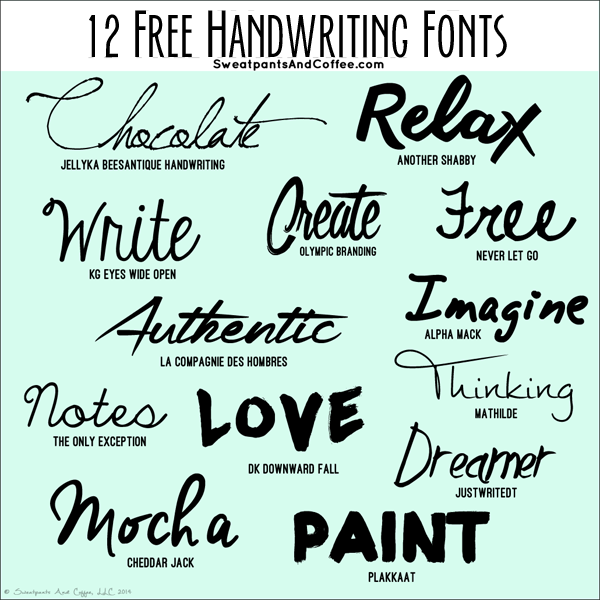 Thus, I’ve gathered some of my favorite free handwriting fonts to share with you. These will also work really well for scrapbooking or paper craft projects. Hi – great suggestions of style… Are these compatible on both platforms or just PC? I use a Mac and all of these fonts are compatible with my OS. Always looking for good stuff to add to the creative writing side for fonts.